You don’t just come here to study; You come here to work. Fran Montano is an Emmy award-winning acting coach and master teacher. He is uniquely gifted in troubleshooting the particular blocks that hold actors back from reaching their full potential. For over 30 years, the Actors Workout Studio has been dedicated to preparing actors for professional work in the film and television industry in a safe and challenging work environment for all levels (beginner through advanced) through our acting classes in LA. Sign up to receive news about upcoming acting classes in Los Angeles, productions, casting notices and special promotions. 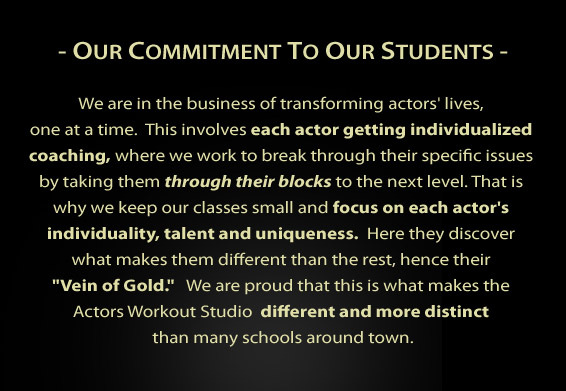 The Actors Workout Studio specializes in Adult acting classes and workshops in North Hollywood, Los Angeles CA. Our Los Angeles acting school provides individualized coaching to actors and students in order to break down blocks and encourage truthful, moment-to-moment, raw acting.